Drying is inseparable part of processing in chemical and pharmaceutical, food and dairy, polymer and ceramic, biotechnology, pulp and paper, agricultural, wood industries and many others. However the process of drying is demanding enormous energy and in many cases leading to emission of carbon dioxide and hazardous gases. At Kerone, we provide modern day drying equipment with high thermal efficiency and advanced emission handling techniques. 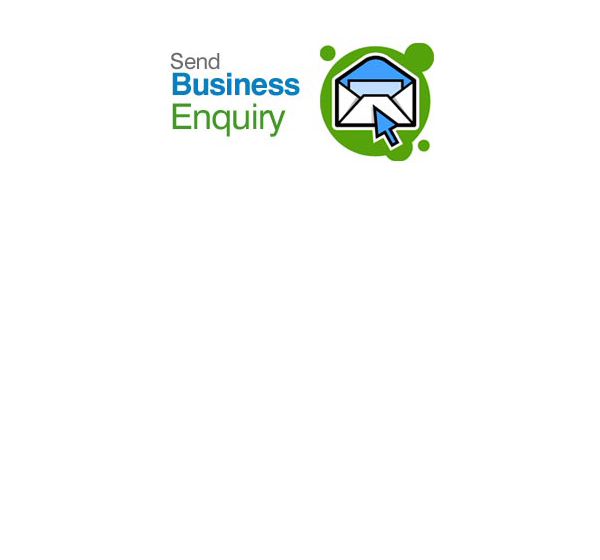 We as having over 42 years’ experience in providing several type of drying solution for various applications. Kerone has specialization in providing the Flash dryer also known as pneumatic dryer, which are designed as built to get fitted for specific industrial need. Pneumatic/ Flash dryers are direct drying units and are known as convective dryers. In pneumatic flash drying system particulate solids to be dried travels through the drying duct along with hot air and it get dried during transport in a hot gas stream. The pneumatic flash dryer system consist of below components: 1) Gas Heater, 2) Wet Material Feeder, 3) Drying Duct, 4) Separator, 5) Exhaust Fan, and 6) Dried Product Collector. 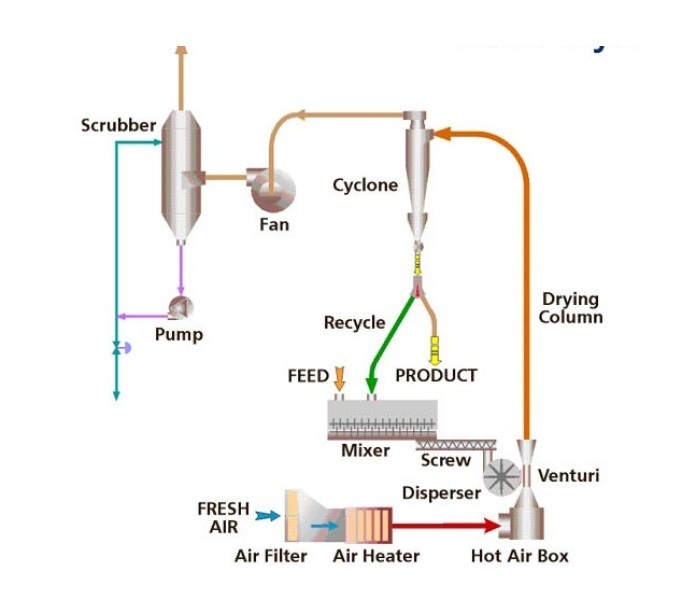 The material to be dried is fed into hog air/gas stream, the stream flows up the drying tube. The gases travel within the stream with velocity higher than the velocity of largest particle. The flash dryer are usually suitable for the removal of external moisture as the contact time between the hot air/gas stream and particle are for very short time. The Dried material and air/gas stream both are collected in separator unit, separator arrangement help to disperse the dried material from the gas stream. It must comply with the regulations for pollution control. For this purpose cyclone dust separators, fabric filters, electrostatic precipitators, wet scrubbers, and fabric filters are used. Kerone helps its clients for selection of best pneumatic dryer that helps in getting highest efficiency and lesser drying time. 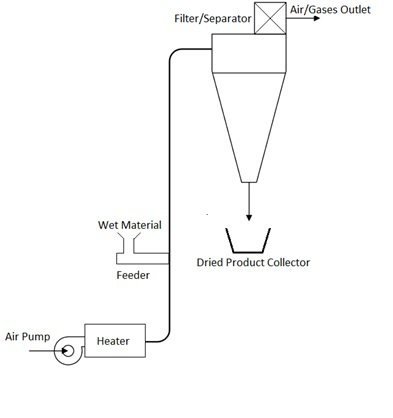 The basic flash dryer design requires to take care of following: 1) Heat Balance 2) Mass Balance 3) Momentum Balance, and 4) Determining Heat and mass balance. 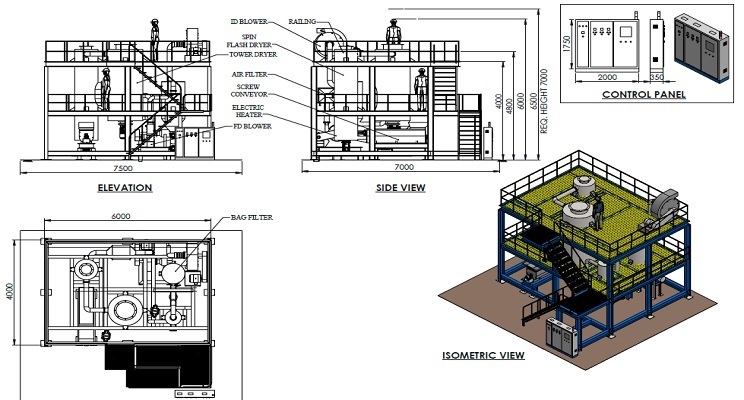 While designing at Kerone we take utmost caution in design of the whole drying system, care must be taken of the gas-heating unit, the material feed section, the particle separation section, and the product collection system. 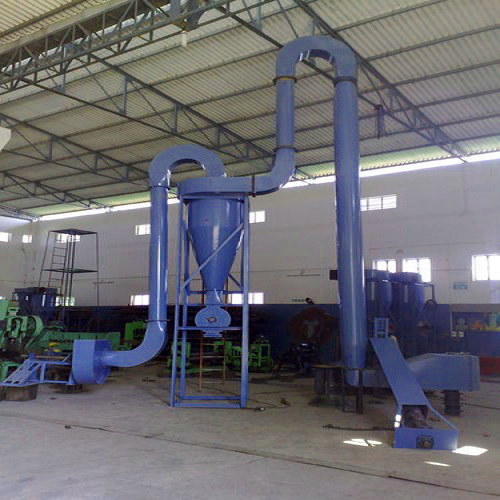 Drying is accomplished at low outlet drying temperatures, hence provides high energy utilization. High drying effectiveness and low energy expenses. Continuous processing can be achieved in small drying time. Pneumatic Flash dryers can process at very high capacity in small amount of scape. 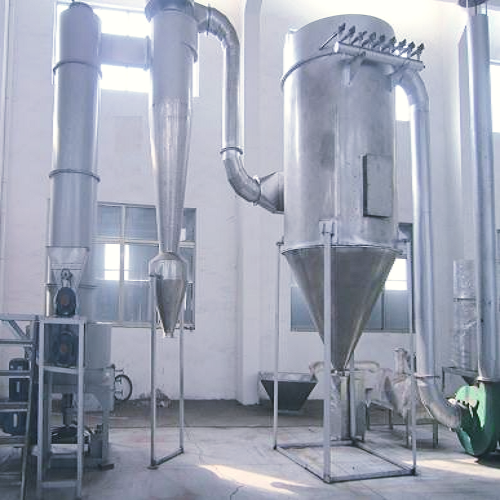 Kerone’s flash dryer provides High thermal flash drying efficiency. 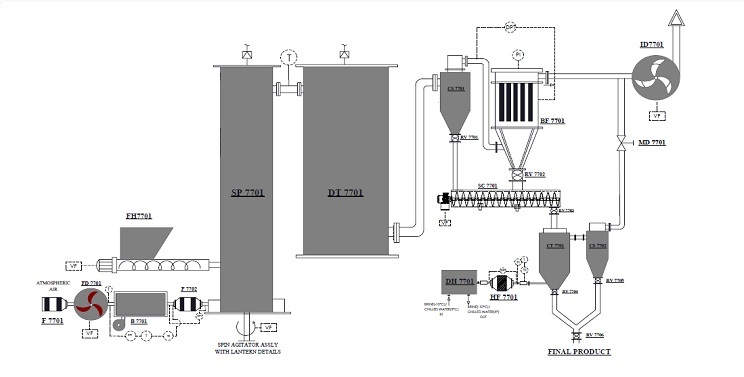 Flash dryer provide high evaporation capacity. Cooling fans with high volume, pressure. Paper & Wood and etc.